Professional Registration is open to practicing Equine Behaviour Consultants who hold qualifications recognised by the Society (see Qualifications & Professional Training page), appropriate insurance and agree to abide by a strict Code of Professional Practice and keep up to date with annual CPD. Liaise with other qualified and insured professionals as a multidisciplinary team for the maximum benefit of client and horse (e.g. Veterinary Surgeons, Veterinary Physiotherapists, Society of Master Saddlers Qualified Saddle Fitters, Registered Farriers and BHS Registered Instructors). When you are concerned about your horse’s behaviour, perhaps not sure if any ‘challenging’ behaviour, misbehaviour or behaviour problems are due to pain, fear, discomfort e.g. from saddle or bit and bridle or just plain ‘naughtiness’, it can be hard to know where to turn for help. For some common signs of behaviour due to fear or pain, see Safety & Welfare page. It can be very worrying if you feel that your horse is not happy and very frightening if you do not feel safe and confident handling or riding your horse due to undesirable behaviour. You will find a great deal of information available on horse behaviour and solving horse behaviour problems on the internet and in magazines. Every horsy friend will have an opinion too – often each one different. 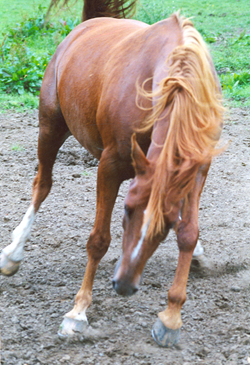 You may have tried all sorts of things to solve your horse’s behaviour problem without success. You may have tried all sorts of training systems and found that some help a bit with some aspects of your horse’s behaviour but not all of it. Some may even have made your horse’s behaviour problem worse. Not all horses and people are alike and not all training systems are appropriate for every horse. Different elements of your horse’s problem behaviour may be caused by different things and each will need to be treated differently. Tiny details in your horse’s routine and lifestyle can have a dramatic effect on how he or she behaves and simple misunderstandings between horses and people can be the root cause of many serious equine behaviour problems. A Registered Equine Behaviour Consultant will investigate and explain your horses behaviour and will help find the solution that best suits you and your horse. What can you expect from a Registered Equine Behaviour Consultant? In order to Register with the Society an Equine Behaviour Consultant must have demonstrated professional competence by examination and shown evidence of sufficient appropriate insurance, including Third Party and Public Liability and Professional Indemnity Insurance. Other requirements include agreeing to abide by a strict Code of Conduct in their professional practice, which requires consultants (amongst other things) to prioritise safety and welfare, assuring clients of the highest possible standards of professional practice and customer care. A Registered Equine Behaviour Consultant will always prioritise safety and welfare. Safety and welfare advice will be given as needed from initial contact onwards. Prior to a full consultation, this will often include the sensible precautions of wearing your riding hat, stout boots ideally with steel toe caps and gloves when around your horse for our own protection should your safety be at risk from the problem behaviour. They may also, for example, offer advice not to ride, travel or to restrict riding and handling to areas where the problem does not occur. When you first contact a Registered Equine Behaviour Consultant, they will offer any necessary safety or welfare advice to help you manage prior to a full consultation. During an initial contact they may suggest you have your vet examine your horse before proceeding further. Where appropriate, they will also also offer interim practical management advice to help you continue to look after your horse in such a way as to minimise the risks to you, your horse and others from the misbehaviour. A Registered Equine Behaviour Consultant will then arrange to make an appointment with you to discuss things more fully and to assess your horse’s behaviour. A Registered Equine Behaviour Consultant is required to be clear about costs and timescale involved, what they are offering, how and when they wish to be paid and to give details in writing before carrying out any work on your behalf. A Registered Equine Behaviour Consultant will take a full history, asking a lot of detailed questions about your horse’s behaviour and lifestyle and may also need to assess your horse’s behaviour to help them work out why your horse behaves as he or she does. They will check that you are happy and confident about anything they may ask you to do on assessment and make clear that you should not attempt anything you are unsure about. You should not be asked to do anything during an assessment that you do not feel happy and confident about doing. They will explain their findings to you and summarise these in writing. If you tell a Registered Equine Behaviour Consultant about signs that indicate to them that your horse’s behaviour may be due to pain or physical problems or they see any such signs on assessment, including any signs indicative of unsafe, inappropriate or poorly fitting tack, they will refer you to the most appropriate professional for further investigation here (see the Safety & Welfare page for professionals recommended by the Society). They will liaise fully with these other professionals for the maximum benefit of you and your horse. If it is a loading or travelling problem they will advise you to make sure your trailer or lorry is up to date with the manufacturer’s recommended servicing and is sound and roadworthy. A Registered Equine Behaviour Consultant will strive to help you find the most practicable and cost effective solution to your problem. They will select, from all safe, humane and effective training methods known to them, those which are the most appropriate for you and your horse in your particular situation. They will offer advice on routine horse care, handling and day to day management where required. They are trained to assess riders for safety and will advise you regarding lessons where required. If appropriate, they will offer a detailed personalised training programme, allowing you to work at your own pace, taking into account your ability, fitness and confidence as well as the time, facilities, assistance and support you have available. They may offer either a written programme for you to follow in your own time or a series of supported training sessions – whichever you prefer or perhaps a mixture of both, depending on your particular needs. A Registered Equine Behaviour Consultant may suggest you keep a training diary to log progress and will contact you to see how you are getting on. As part of their follow up procedure, many consultants offer continued telephone support without obligation. A Registered Equine Behaviour Consultant will not waste your time with a training programme if it is their professional opinion that you and your horse are not well suited and unlikely to be able to manage safely together. They will be sympathetic and do their best to give you all of the information you need to help you decide what to do for the best, both for your safety and your horse’s welfare. They are required to provide receipts if requested. They are required to be clear about prognosis and about future charges before carrying out any further work on your behalf, should any further help or advice be required. Apart from the technical information required by any other professionals (e.g. vets, farriers, saddle fitters etc) assisting to resolve the problem behaviour, when required to do so by law or to ensure the welfare of your horse, a Registered Equine Behaviour Consultant is required to keep all of your details and their findings confidential. Most Registered Equine Behaviour Consultants work fairly local to their home base enabling them to offer long term commitment to their clients, helping them through the crisis and taking them forward to happy and successful partnerships with their horses in the future. A Registered Equine Behaviour Consultant will offer the highest standards of professional services and customer care. If you are not happy for any reason they will do their best to find a mutually satisfactory solution, failing which you may raise a complaint with the Society. Anyone not satisfied by the work or conduct of a Registered Equine Behaviour Consultant can report them to the Society’s Disciplinary Board. The report detailing the complaint must be made in writing to the Secretary Dr M D Marsden, PO Box 8776, Biggar ML12 6WL. All complaints will be investigated and responded to within 21 days. The results of the investigation and recommendations will be given in writing to both client and consultant and the Disciplinary Board will do its best to resolve any issues and reach a mutually satisfactory solution. In the event of malicious or unfounded complaints, the Society will support a registered Consultant and may assist them with litigation here. A Registered Equine Behaviour Consultant is required to abide by a strict Code of Conduct in their Professional Practice and may be ‘struck off’ the Society’s Professional Register, should a mutually satisfactory solution not be reached or a serious complaint be upheld by the Disciplinary Board. See our Find a Consultant page for a list of consultants in your area.